Fill 24 pockets with a section of the Christmas story and a chocolate coin. 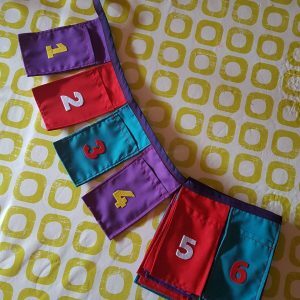 You could make your own using numbered envelopes glued onto a ribbon or purchase this GodVenture Advent Pocket Bunting. And even the job of cutting the story into 25 pieces is done for you in these Christmas Story Cards. Read the whole Christmas story from the Bible, maybe even in one sitting. You could do some colouring while you listen (lovely colouring poster here). 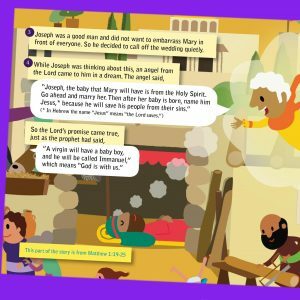 The Bible text is in The Christmas Bible Storybook which comes with the GodVenture Sticker Advent Calendar or if you cut and paste these references into biblegateway.com you could listen to an audio version (Luke 1:26-38; Matthew 1:18-25; Luke 2:1-21; Matthew 2:1-12; Luke 2:39-40). 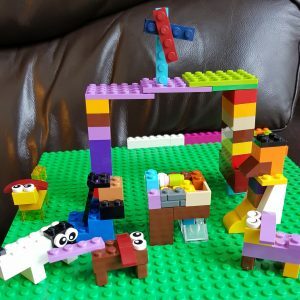 Create a nativity scene out of Lego (or Duplo or wooden blocks or Stickle Bricks). Look at the story in the Bible and choose which characters and structures to build. You could also use wooden blocks, stickle-bricks, or any building materials. Buy or borrow 24 books (preferably Christmas ones) then unwrap and read one a day. Older children may prefer a chapter book such as the 24 chaptered The Christmas Mystery by Jostein Gaarder. More ideas on books you could get here. 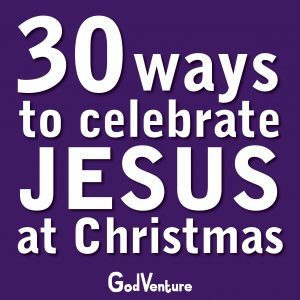 Read the Christmas story with each family member speaking the words of one character. You could make this into a play using the Bible text. 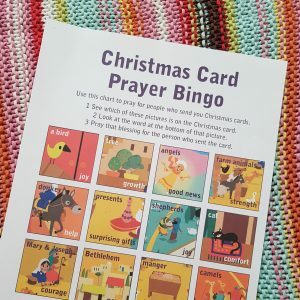 (The Bible text is in The Christmas Bible Storybook which comes with the GodVenture Sticker Advent Calendar) or use this free family play which comes in A Christmas Family GodVenture activity sticker book, and which is designed to work with any number of participants. 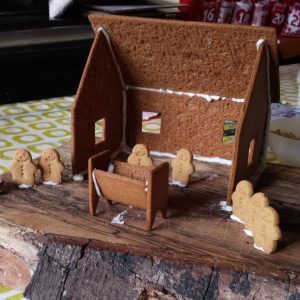 Leave one side off a gingerbread house to make a stable, and use the chimney pieces to make a manger. Add people and eat! The IKEA gingerbread house works well as you can see here. 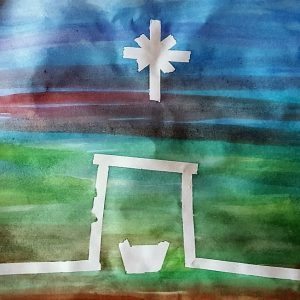 Make your own Christmas Bible Story book. Make it fun by creating pictures for it using your toys. 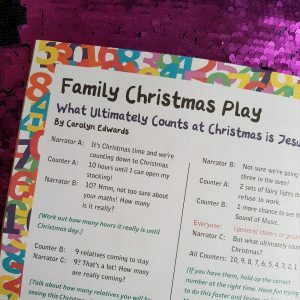 Divide the Christmas story into four or more sections then create a picture for each section. You could dress up and pose, use a nativity set or create pictures using felt or wooden blocks, natural materials or whatever you choose! FreePrints print 20-page photobooks for £5.99 using a phone app. Use an angel-shaped cookie cutter to print paint over a large sheet of paper. 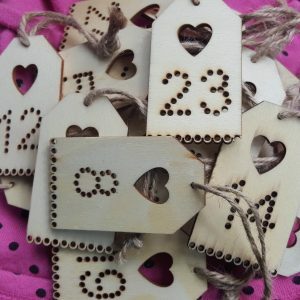 You could also make Christmas cards and gift tags in the same way. Chat about what the angels do and say in the story. What part do they play in the story? What would the story be like without them? You could of course use the cutter to print Christmas cards or gift tags too. 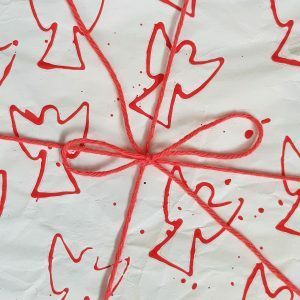 We sometimes use creating angels to express our prayers that God will send angels to help one of ours friends, so you could use the creation of paper, cards or tags as a way of blessing people through your creative prayers. Dress up as the characters from the Christmas story and take some photos. As you do this you could also chat about why you’ve chosen each character and what you think they may have been like. What part do they play in the story? Could we leave them out and still have all the story we need? 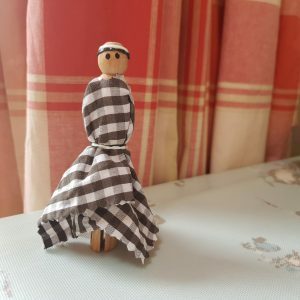 You could download this set which is really fun, or you could make tunics out of pillowcases and headdresses with tea towels and a ring of elastic. Get your whole family to dress up and take a photo – perfect for Christmas cards! Make a nativity set using peg dolls, wrapping each in a piece of cloth attached with loom bands. Add two dots for eyes and use them to play out the Christmas story. You can get peg dolls here. Alternatively, buy a nativity set you can play with. I’ve just bought this set, which you could either use as it is, or add your own decoration. 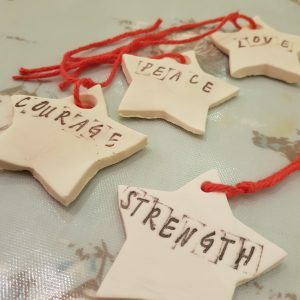 Make clay ornaments with words of blessing on to give to people as ornaments. You could write or stamp words that describe blessings, which you pray God will give them, such as courage, peace, joy, strength. You could buy air dry clay or make ornament clay with a recipe from The Imagination Tree. Which blessings do you see in the Christmas story? 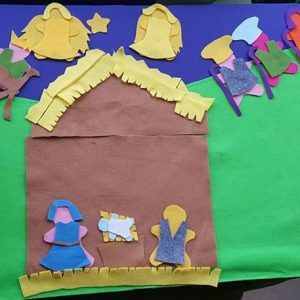 Cut simple people shapes out of felt and use them on a felt backdrop to create the nativity story. You could add a green hill shape on the back Simple people shapes could be cut out using a gingerbread man cutter as a template to draw around then add simple extras, such as hair or headdresses, belts, tunics and cloaks. You can download a free template here. 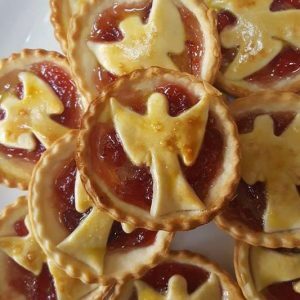 Bake jam tarts or cookies using an angel-shaped cutter and give them to a friend, neighbour or a delivery person. If appropriate, offer to pray for them, including a prayer that God will bring them good news, just like the angels brought good news at the first Christmas. 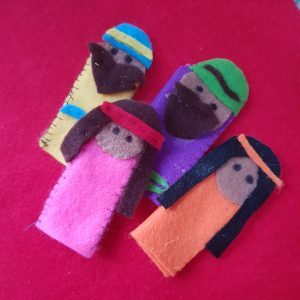 Make simple puppets then use them to re-tell the Christmas story. You could even film it and share it with friends and family. 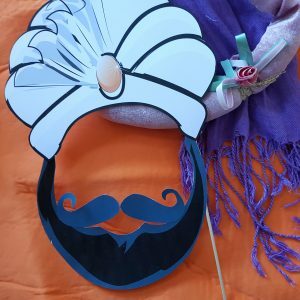 Younger children may enjoy simple felt finger puppets or people created from the fingers of gloves, decorated with eyes, hair or a headdress and belt. Alternatively, you could print pictures of the characters and glue lolly sticks on the back. Set up a cloth across a chair or table to be the theatre and share the story together. You may like to film it and share it with your family and friends online. 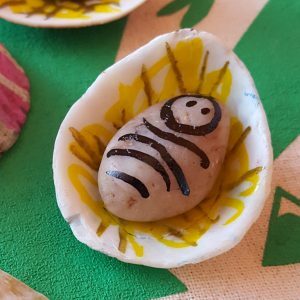 Use black Sharpie on a white stone and glue it into an upside down shell or paint stones white then add a beige circle face at one end. Use Sharpies to draw eyes, nose and mouth on the face and lines to make the face look ‘wrapped’ in white cloth. Write the tag #JesusRocks on the back then hide the rock for someone to find it. You could add hay under it and a little note suggesting people either re-hide it for someone else to find or take it home and look after it. Put something usual or festive aside each day until you have 24 items then give them to your local food bank. Make a birthday cake for Jesus. This could be done at any time, but many families like to do this on Christmas Eve. What will you put on yours? Re-read the Christmas story, looking out for things said about Jesus (usually by angels) then create Christmas tree ornaments with words or symbols representing who Jesus is. Make your ornaments out of Fimo, Shrinkits, letter beads on pipe cleaners, or whatever you choose! You could take inspiration from Isaiah 9:6. 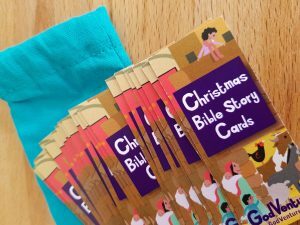 Write or draw the Christmas story onto a series of cards, hide them, find them, then put them in the right order to re-tell the story together. This could also be done with clues using pictures printed from the internet. You could use these Christmas Story Cards where all the hard work is already done. 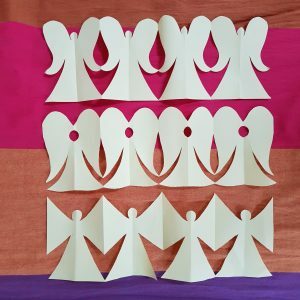 Create a throng of angels like concertina paper people then decorate them. You might do this with glitter, shiny foil or similar, or with words which the angels say in the story. 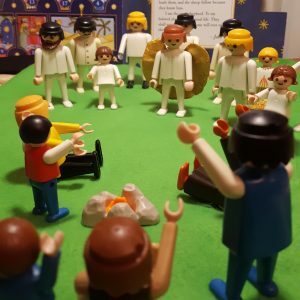 As you create, you could chat about what the angels do in the Christmas story. Use the angel throng to decorate your house. For really long strips, you could use wrapping paper! Read the Christmas story from different versions of the Bible, and play spot the difference. This works best if you take the story in sections, for example, the angel comes to Mary, the angel and Joseph, the shepherds and the wise men. Use Bibles in your house or BibleGateway to find different versions. Which version do you like best? Why? 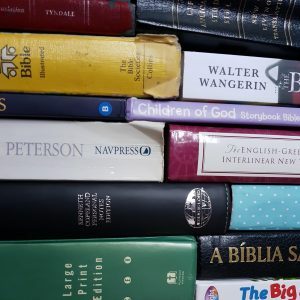 Younger children could compare different children’s Bible versions such as the Children of God Storybook Bible (at time of writing, currently at half price) or The Big Bible Storybook for younger children. You could also look at re-writes of the story such as in The Book of God or Oriel’s Diary. 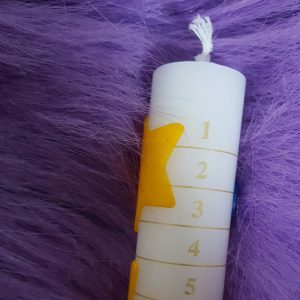 Create a traditional candle wreath with four candles and one in the middle. 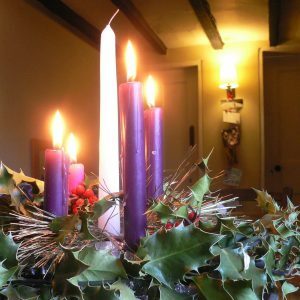 Light one in the first week of Advent and say prayers. 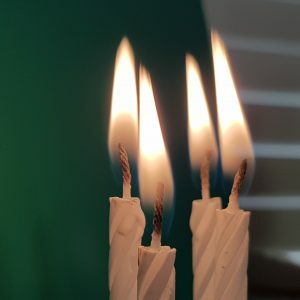 Light two candles in the second week, and so on. Light the middle one on Christmas Day. When you light your candles, you could read a Bible passage about light or pray light themed prayers. Here are some ideas. 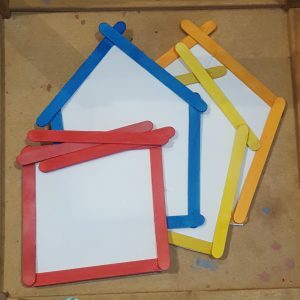 Glue 5 lolly sticks together to create a pointed roof on a house, then glue a piece of paper in the frame you have created. When the glue is dry, draw or paint a picture of the Holy Family, including any additional characters you feel appropriate. 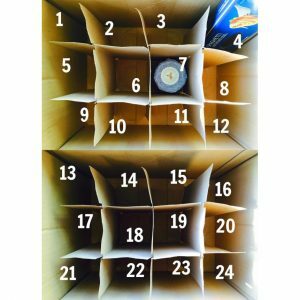 You could make a giant version using sticks, creating a centre piece of Christmas art for your home. 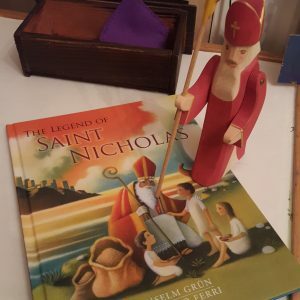 Explore the story and traditions around Saint Nicholas using books and websites. Chat about which of your traditions remind you of his story. Are there any new traditions you’d like to adopt? 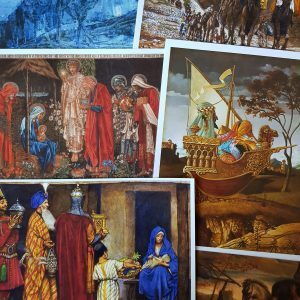 Search online for nativity art, and look at how the same stories have been depicted differently by different artists. Search for classics and contemporary pieces. You might like to look for pictures of the angel visiting Mary, the angels and the shepherds, the shepherds visiting Jesus and the wise men arriving. Which picture do you like best? 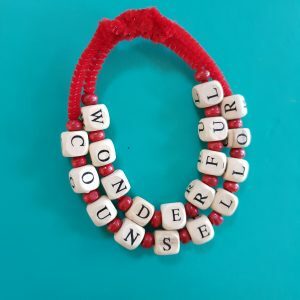 How does it speak to you? Which one helps you see the story from a different perspective? What would you create to express how you feel about this story. 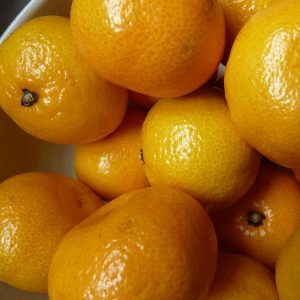 Peel a satsuma or other segmented fruit. Take it in turns to take one segment and pray for God to bless someone you know, perhaps mentioning something specific, then eat the segment and pass the fruit. 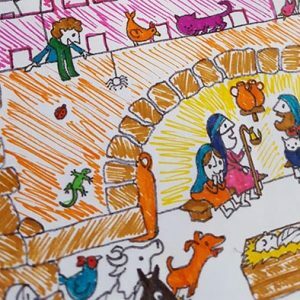 Download some beautiful nativity colouring sheets and spend time together colouring and listening to Christmas worship music or the Christmas story from an audio Bible and meditating on the wonder of the story and what it means for you.